MARKHAM – With its own state-of-the-art public transit station already fully functional, and more and more housing developments popping up every year, Markham Centre is well on its way to becoming the City of Markham’s environmentally sustainable and culturally vibrant focal point for the 21st century. Encourage and embrace compact development, to confront and help overcome the issue of increasing land scarcity in Markham and the GTA. Intensify development near public transit routes and key stations, in such a way that area residents are encouraged to use environmentally-friendly transportation when possible. Create a vibrant mixed-use area that boasts homes, businesses, schools, stores, and entertainment – all within easy access of families residing in the area. 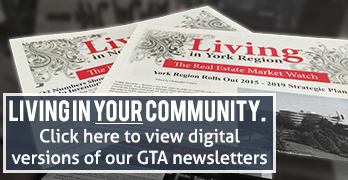 As the City of Markham continues to develop and evolve, home buyers are flocking to Markham Centre while it continues to develop a strong reputation as one of the area’s premier “live, work, play” communities. “The Benchmark” townhouses just north of Enterprise Boulevard. Markham Centre’s Advisory Group – comprised of peers from all over the community, as well as representatives of affected organizations and development companies – set out to create Markham Centre as an intentional reversal of suburban sprawl. That governing principle led developers in the area to design and construct residential areas that embody architectural style, refinement, green space, and strategic planning to minimize distance from transit hubs, businesses and workplaces. Circa, Tridel’s mix of elegant terraced condominium residences and cozy residential townhomes, right at the intersection of Highway 7 and Town Centre Boulevard. Majestic Court, the Times Group Corporation’s high-rise condominium development at the northwest corner of Clegg Road and Town Centre Boulevard. Featuring 532 residential units, Majestic Court reflects both environmental consciousness and a modern design aesthetic. The Times Group Corporation’s other big development in the area, Uptown Markham, is located on the south side of Highway 7 between Kennedy Road and Warden Avenue. Boasting southward views overlooking the scenic Rouge River Valley, this exciting project is already well underway, with two key developments – River Walk East and River Park – scheduled for completion and opening in 2013. Remington Developments’ ambitious Downtown Markham project is under ongoing construction south of Uptown Markham, near Enterprise Boulevard. River Walk and Phase 1 of River Park, the newest planned addition to Times Group Corporation’s Uptown Markham development. These two mid-rise developments are located next to Uptown Market, Markham’s newest destination for fresh shopping – offering popular shops and restaurants such as Whole Foods and Panera Bread. Fontana, an H&W Developments project scheduled for completion in 2014, will feature 663 units – a mix of condominiums and townhomes. These homes, ranging in price from $200,000 to $500,000 and up, will feature plenty of elegant in-unit features and various amenities on site. With environmental responsibility at the heart of its design plan, Markham Centre is shaping up to be an enviable hub for key public transit routes. In fact, this cutting-edge neighbourhood is already home to the first fully-functional stretch of Viva’s Rapidway – a system of dedicated roadways for buses and state-of-the-art transit stations like the one in operation on Enterprise Boulevard just east of Warden. Click here for a full map of Viva’s planned rapid transit routes, and the projected construction periods for each segment. The introduction of more Rapidway segments and stations, along with the extension of Toronto’s subway lines to Highway 7 (already underway on the Spadina line), will result in Markham Centre residents being offered a world-class level of public transit availability and efficiency. 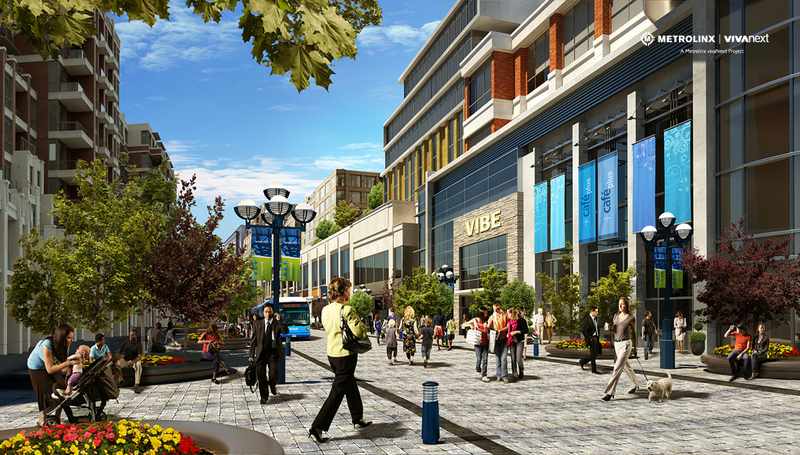 Markham Centre will eventually be home to the GTA’s first transit and pedestrian mall – this colourful rendering was provided by VivaNEXT at their official web site. Along with comprehensive transit service, some of the other amenities planned for Markham Centre include shops, theatres, cafes, and a 10-acre park. The area is also planned to be the site of the GTA’s first “transit-pedestrian mall” – an area specifically designated for those travelling on foot or by bus. 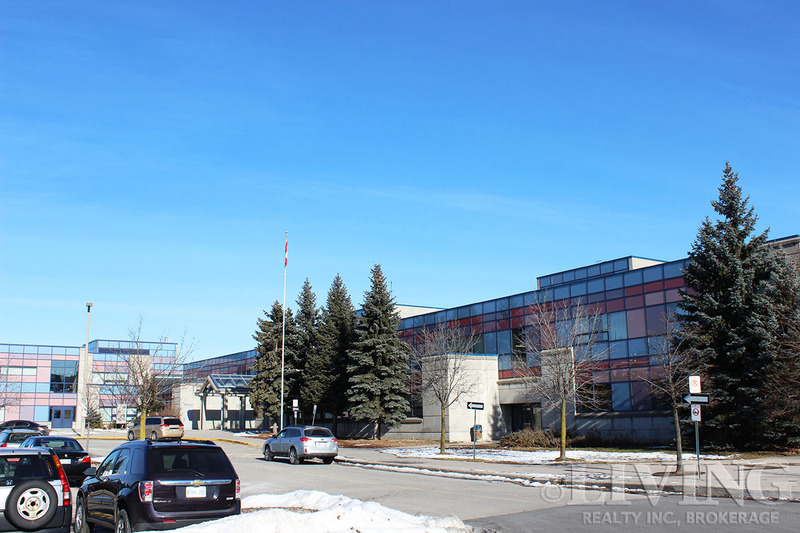 Unionville High School’s spacious building sits right next to the Markham Theatre aside Town Centre Boulevard. Long renowned for its prestigious and highly sought-after Arts Unionville program, Unionville High School is located in the heart of the city, just a stone’s throw away from City Hall and next door to the popular Flato Markham Theatre. While the school has developed a strong reputation for arts education, its students succeed strongly in other curriculum areas as well. According to EQAO reports on mathematics and English performance, during the 2011-2012 school year, 96 per cent of Unionville HS’s grade 9 students (who were enrolled in academic math courses) met or exceeded provincial standards for standardized math testing – a feat only 90 per cent of all students across York Region were able to accomplish. Unionville HS was also able to achieve a similar degree of success in standardized English language evaluations, with a 95% success rate on the Ontario Secondary School Literacy Test (OSSLT) in 2011-2012. 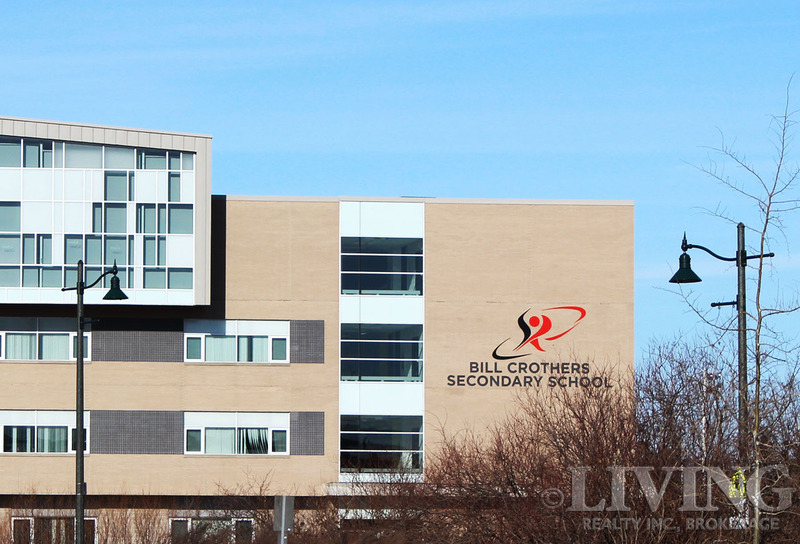 Bill Crothers Secondary School is conveniently located right by the Enterprise Road Viva Station and the Unionville GO Station. Bill Crothers Secondary School’s course offerings place a strong focus on physical education, but just like Unionville High school, offers its students a well-rounded education in all of the subject areas and a comfortable atmosphere in which to learn and grow. Bill Crothers SS’s students performed similarly well in 2011-2012 standardized testing, with EQAO reporting that the school’s first-time-eligible students achieved a 96 per cent success rate on the OSSLT. The same year, EQAO also reported that 93 per cent of the school’s grade 9 academic math course participants met or exceeded provincial standards in mathematics. Why Buy a Home in Markham Centre? With development and construction continuing to take place in the area, and condominiums selling at an incredible rate, young families or those considering starting families will find Markham Centre has a great deal to offer. 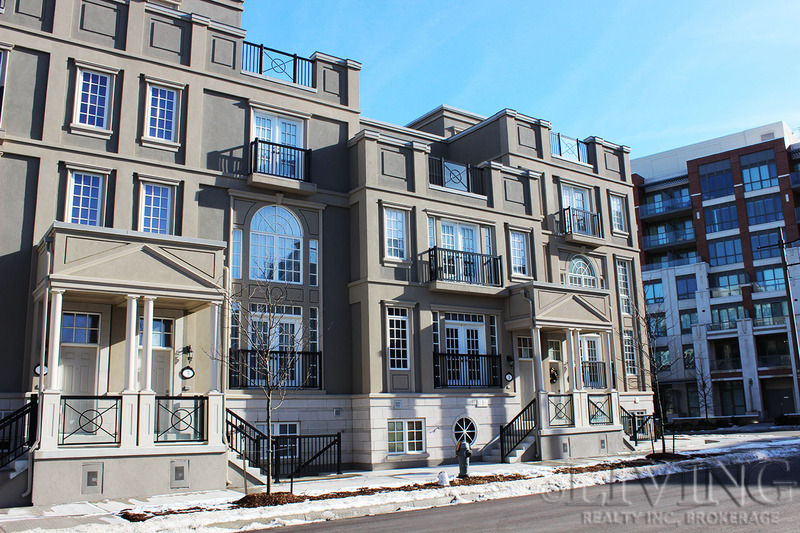 In this unique and up-and-coming neighbourhood, newer homes – featuring luxurious modern finishes by first class developers and builders – are conveniently located right next to the type of ‘downtown’ amenities and conveniences that modern professionals have come to rely upon and expect. 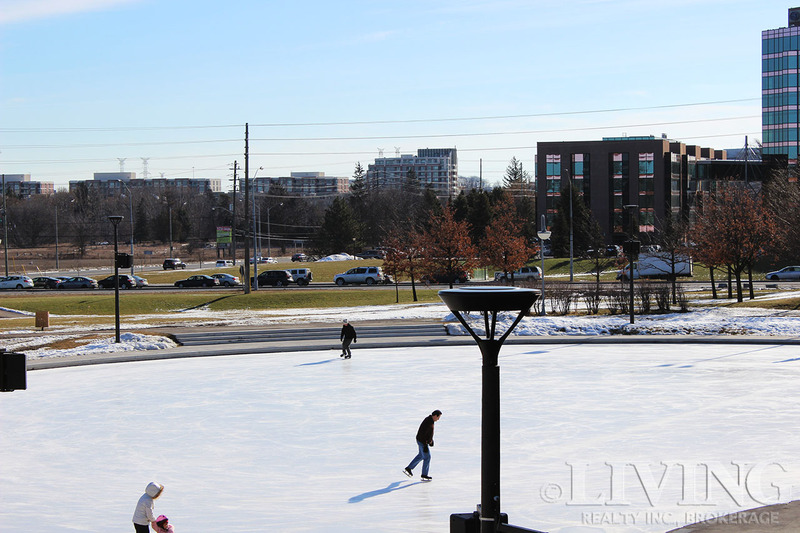 Markham Centre features plenty of fun outdoor activities and green spaces. As a Markham Centre resident, not only do you have access to great neighbourhood amenities and transit – it also makes commuting easy. Markham entered the 21st century with a strong reputation as Ontario’s answer to Silicon Valley and the technology capital of Canada. Today, the City of Markham is home to 900 companies in the technology and life sciences sectors, and to the head campuses of 400 national companies. If you’re interested in purchasing a property in Markham Centre – either for your own family or for investment purposes – a REALTOR can help you decide which location and home type would be the best fit for your needs and budget. Living Realty has been providing service to Markham for over 30 years, and with two offices located right here in Markham, the top salespersons and brokers at Living Realty would be happy to assist you – contact us today for more information.